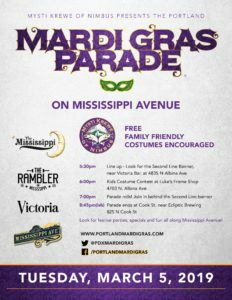 Save the date for 2019’s Mardi Gras Day Parade – March 5! 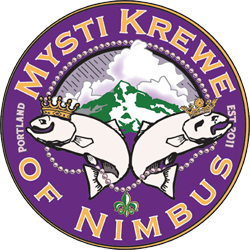 Each year the Krewe hosts a Mardi Gras parade for everyone on Mississippi Avenue. This free family friendly event invites all to dress up and come dance in the streets! Krewe members decorate signature mini-umbrella ‘throws’ to hand out to lucky participants. Free, Family Friendly, Community Event! 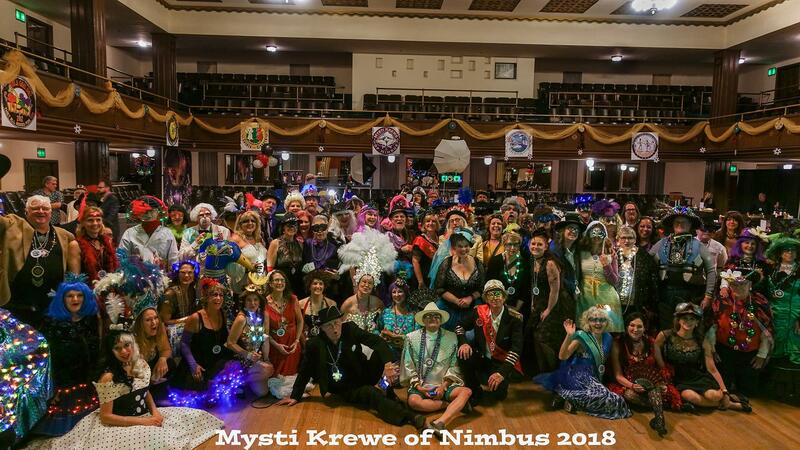 Join the Mysti Krewe of Nimbus for the Mardi Gras Parade on March 5, 2019 – Fat Tuesday! 6:00: Costume contest begins – aim to end by 6:45 or so. 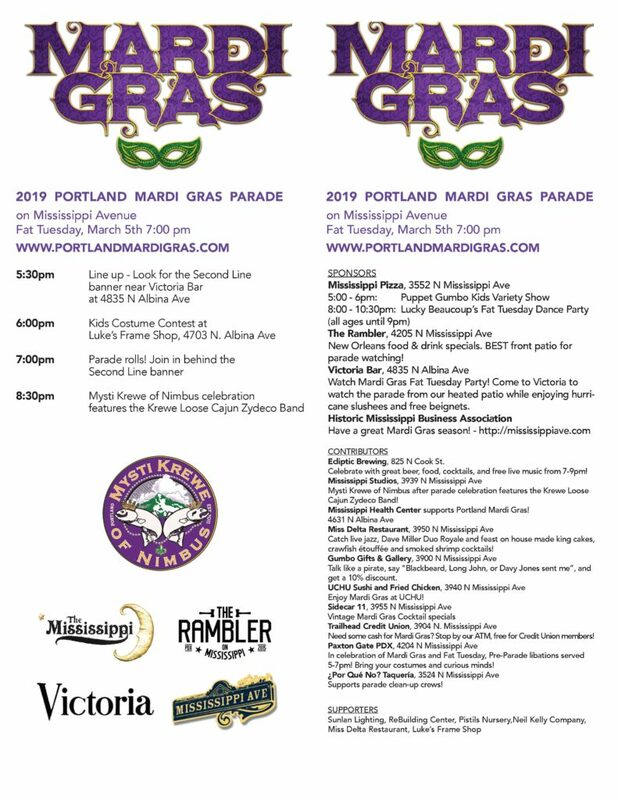 The Costume Contest is judged by the current Mardi Gras King and Queen who will be crowned at the Mardi Gras Ball the Saturday before the parade. Parade is family-friendly and open to all. You can parade with us, or watch from the sides, or both. We ask that participants line up behind the Second Line Banner in the back of parade. All beads and mini-umbrellas in our wagons are for Krewe only to distribute to the crowd. Thanks for your enthusiasm! And thanks to Victoria Bar and Luke’s Frame Shop-Albina, and everyone on Mississippi Ave for your support! Actually, the first Mardi Gras parade in the U.S. didn’t take place in New Orleans. It was held in Mobile, Alabama (under French rule) in 1703. The tradition eventually marched down to New Orleans and today over 70 parades roll through the city every year during Mardi Gras season. Each parade is run by a Krewe and has a theme, voted on by Krewe members. All floats are decorated to fit the theme. Krewe royalty and other members ride the floats and throw beads, doubloons and trinkets to people on the street. The biggest krewe parades roll the final few days before Fat Tuesday. They include the Krewes of Endymion, Bacchus, Zulu, and Rex. It takes almost an entire year to build the floats, so Krewes get started just days after the previous Mardi Gras has ended. Dozens of second line parades occur in New Orleans throughout the year, all over the city. Anyone can join in. Participants dance and strut in the street and often deck themselves out in brightly colored suits, sashes, and hats, while carrying parasols and banners. It has the spontaneous energy of a lively, moving block party.